As the narrator observes the comings and goings inside the prison walls, his focus revolves around a few key characters. “The lady” is the death row investigator who is brought in to save a fellow named York. The interesting thing is that despite York’s wishes to face death row, she is working tirelessly to get him off. If you meet Rene Denfeld and hear her story, it is not a huge stretch to see the similarities between “the lady” and herself – one of a death row investigator whose clients are death row inmates. At times, when you realize that the inmates have committed horrendous crimes, the story can be hard to chew. But “the lady” always believes that there is another side to every story. Slowly she is willing to arrest her life to be taken over by the death penalty investigation – a labour-intensive process that can take months to locate ancient records, track down witnesses and diagnose the truth of a crime. The narrator’s own story arc is something that Rene Denfeld lets us keep guessing throughout the book. The reader assumes that either he must have committed a heinous act or is being held wrongly in a prison for something he didn’t do. But he draws us in with his poetic observations and we start to also see the refreshing way he sees life. And despite what the dungeons may really be like, what we do know is that he is happy to be in this enchanted place. It is interesting that Rene Denfeld very rarely refers to her characters by their actual names. The warden, is simply, “the warden”, the death penalty investigator is “the lady”, and the narrator doesn’t really have a name. It almost feels like this is intentional. Perhaps just like the outside world has forgotten the nameless, faceless inmates who are on death row, The Enchanted reminds us that these people and the others that touch their lives, continue to live in anonymity. 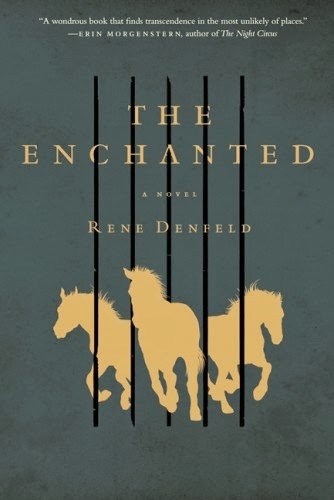 And as a result of this hauntingly, and beautifully told story, Rene Denfeld has managed to give them a face and a voice hitherto forgotten in the depths of shadows and darkness.